Foursquare’s list of consumers’ favorite pizzerias by state revealed much more than which places had earned the public’s loyalty. 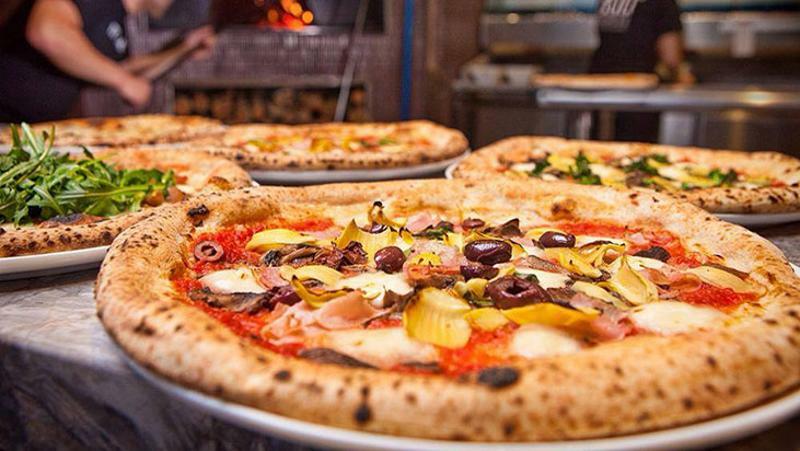 A review of all 51 choices tells much about the state of the pizza business, including these insights that struck us as we were drafting descriptions of the Top 51. Whether the adult stuff is part of a delivery or an add-on to a takeout order, clearly it’s helping operators halt the loss of high-margin beverage sales to customers eating at home. Soft drink sales may still be cannibalized by the purchase of a 2-liter bottle from the supermarket, but customers may prefer buying a growler of cold craft brew with their pies if the price isn’t a turn-off. Of course, sales by restaurants of alcohol for off-premise consumption is not legal in many states, but laws are changing, as the National Restaurant Association has noted. It cites the delivery or takeout sale of booze as a significant opportunity. What might have been a novelty a few years ago—pan-Asian ingredients of some sort served atop a pizza crust—now appears to be a mainstream and fairly popular option. We were struck by how many of the Top 51 offered a Thai chicken pie. Ann Kim, a pizza maker of Korean ancestry, features such toppings as kimchee, soy sauce and short ribs. Fong’s—in Des Moines, Iowa, no less—features such selections as an egg roll-inspired pizza, along with one made with crab rangoon. Indianapolis’ Jockamo offers an Indian riff called The Bollywood. The national delivery chains are locked in a discounting firefight, determined to out-discount the other guy. We were struck by how many operations in the Top 51 became local favorites with pies priced in the $15-and-up range. Goodfellas took the cake with a $34.95 pizza that supposedly can feed 10. A purchase that hefty would buy a lot of discounted pies from Domino’s and Pizza Hut. Most of the pizzerias on the list were independents, and they’ve paid attention to how the big delivery chains have built check averages by offering desserts to round out an order. Clearly Italian classics ruled the after-dinner listings, but there were some interesting riffs, including The Rail’s Fruity Cabooty, a concoction whose description called to mind a fruit calzone. Although we saw an incredible array of toppings being offered, from Peppadew to crab, the possibilities that seemed to impress Foursquare users the most were mushrooms and leeks. Those ingredients were mentioned repeatedly in the assessments and posts that figured into Foursquare’s selection of each state’s best establishment.